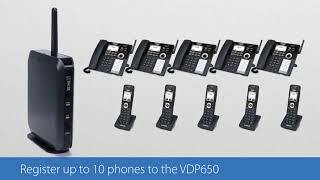 Answering and transferring calls is easy with the VDP650 Cordless 4-Line Series. The cordless deskset and handset features key system emulation for improved call handling, making it easy to see incoming calls, hold calls, and pick up a call on hold from the handset with a simple press of a button. With seamless handover between repeaters and the VDP650 base, don’t worry about losing a call while walking around your workspace. DECT 6.0 technology allows people to move and stay connected with up to 500 feet of range. The series supports up to eight SIP lines or accounts. If and when your footprint expands, add up to five accessory VSP605 DECT repeaters for increased coverage. It’s easy for your employees to handle multiple calls, and always know who’s on hold and needs attention. The key-line mode of operation means someone can place a call on hold with one button, then retrieve the call from another device. The VDP650 Series is ideal for small businesses that need an easy to learn solution. Pizza shops, retails stores and auto body shops find this system the perfect communications tool for their busy workplaces.